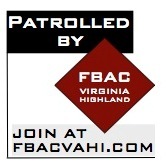 Are you a member of FBAC? Do you have a current yard sign? These signs serve as a deterrent to criminals and as promotion for the program so that we may gain more members. The newer sign looks like this. If you don't yet have this sign in your yard, please stop by John Wolfinger's front porch where you will find a supply of the signs. If you have one of the old black and white signs, please leave it with john as the wire frame can be reused for new signs. Are you a street captain with many FBAC Members on the street that need signs? Contact John with a count of how many you need (so he can make sure to have enough on hand) then stop by and pick them up all at once. Don't know where John lives? Ask your Street Captain. Don't know who your street captain is? Send a request to Eleanor Barrineau, Neighborhood Watch Street Captain Coordinator ([email protected]) and we will get you connected.